This article is about "hernia", a condition in which part of an organ protrudes through the wall of the cavity containing it. There are many types of hernia. But in this issue, we'll talk about a specific type of hernia of the digestive system called "inguinal hernia", which can cause sudden stomach pain. What kind of sickness is this? And who are more prone to this type of disease? Untreated Hernia Can Be Life-Threatening! Did you know that surgery for inguinal hernia is one of the most commonly performed operations of the digestive system? If left untreated, it can lead to intestinal necrosis (lack of blood supply) because of trapped or strangulated intestine. Symptoms and signs of inguinal hernia include: sudden severe pain, and a bulge in either side of the pubic bone (groin area) caused by protruding intestines. Protruding Intestines? The Mystery Behind Hernia Revealed! The key in solving the mystery of inguinal hernia relies on the "hole" in the abdominal wall. Usually, this hole in the abdominal wall occurs at birth. This is when the abdominal lining doesn't close properly, leaving a weakened area. This differs among men and women because of the way the structure of their body develop before birth. In male babies, during conception, the testicle comes down from the abdominal cavity to the scrotum, along an open area (inguinal canal) that typically closes by the time the child is born so that the testicles won't move back into the abdomen. Female babies also have this open area but there's less chance that this won't close after birth. If this inguinal canal does not close properly, a hernia may develop. In other cases, weaknesses in the abdominal muscle wall occur later in life for some reasons, and the intestine protrudes eventually. These may include: injury, post-surgical operation (prostate surgery), pregnancy, and heavy lifting. Smokers are also at risk. Children up to about six years old who have undeveloped abdominal lining are more likely to experience hernia later in life. Early stages of inguinal hernia are rarely painful and the only usual signs are bulges in the groin area, which is often visible when standing or when coughing, and disappears when reclining. But when they do become painful or when significant pain is suddenly observed, then it means the hernia had already progressed to the extent that it may result to fatal consequences. Remember, a protruding intestine may lead to strangulated hernia and ischemia because of insufficient blood supply. Using both of your hands, make a triangle with your thumb and forefinger as shown in the figure below. Rest your whole palm on the base of your thigh. Simulate coughing while applying slight pressure to the groin area using your fingers. At this point, if you feel a budge coming out (a lump about the size of a ping pong ball) or any abnormal motion, then this may indicate a hernia. If the bulge is hard or does not disappear, it is recommended that you consult with a specialist immediately. The most common treatment for inguinal hernia is surgery to close the hole in the abdominal wall. Large Intestinal Hole (Diverticulum) -- Caused by Diet? Hernia is a disease of the small intestine popping out due to a hole in the weak point of the abdominal wall. But there is also a similar condition that can happen in the large intestine as well. This is called colonic diverticulum or Diverticulitis. According to a survey conducted in a hospital in Japan, diverticulosis incidence is increasing in recent years. 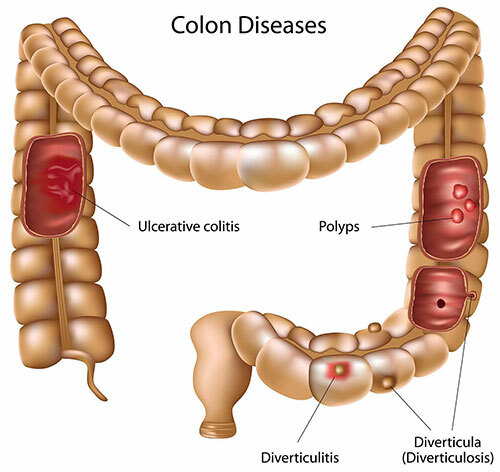 In fact, 1 out of 3 people over the age of 60, has colonic diverticulum. This disease is characterized by crater-like holes in the colon lining of the large intestine. With diverticulitis, inflammation may occur when bacteria or stools get caught in a diverticulum. Although rare, in a worst-case scenario, the inflamed part may rupture and become life-threatening as bleeding occurs. It's been thought that the risk of getting colonic diverticulum is closely related to inadequate intake of dietary fiber. Many health professionals recommend 20 grams per day of dietary fiber. A high incidence of diverticulitis in Japan is attributed to their low fiber intake. Currently, the average Japanese only takes about 13 grams of dietary fiber per day. In conclusion, dietary fiber is important to prevent the creation of these "miserable holes" in the intestine.